David Le/Gloucester Daily Times. 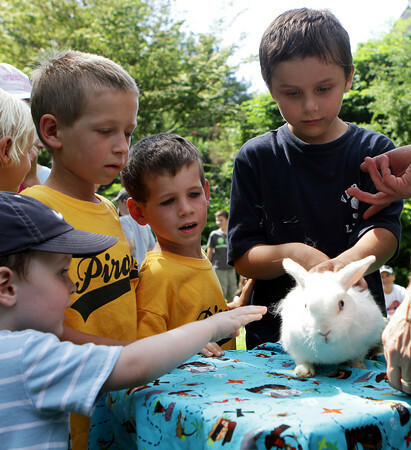 From left, River Lacroix, 3, Daniel Merc, 7, Edward Merc, 5, and Sean Brown, 9, pet a rabbit that "Awesome" Robb Preskins, also known as Captain Robbie Bones, had pulled out of a trick box during the Sky Pirate Show at Millbrook Meadow Park in Rockport on Wednesday afternoon. 6/29/11.